A magical stand with infinite possibilities. A clean, simple stand, weighted and shaped to hold your iPad, iPhone and iPod upright in landscape or portrait mode. 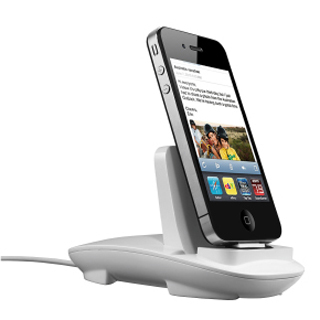 The MagicStand is more than just a comfortable place for your iPad, iPhone and iPod to hang out. The design ensures you can plug in your doc cable (available separately) to charge and sync. The detachable holder from the MagicStand can be attached to the Konnext™ SynCharger System which gives your iPad, iPhone and iPod charging, synchronization and multimedia capability instantly.